CCNY is among the top 100 schools in the North, according to U.S. News & World Report's 2018 rankings. The City College of New York remains among the top 100 Best Regional Universities in the North and a Top Public School in the North, according to the U.S. News & World Report 2018 rankings. Celebrating its 170th anniversary this year, City College climbed 10 places in the Top Public Schools rankings in the North from 2017. CCNY is now #16 among 51 schools that made U.S. News’ stringent ranking. It was #26 last year. 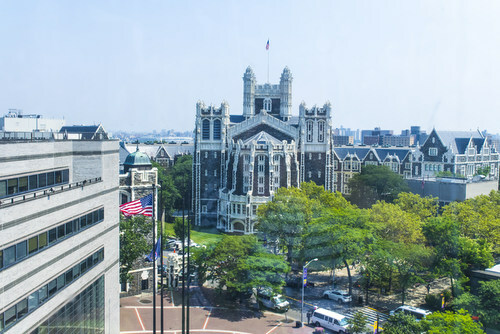 CCNY also made a considerable jump in the Best Regional Universities rankings. It is #56 among 196 universities – a leap of 29 places from #85 in 2017. There is also a discernible increase in the average freshman retention rate, an indicator of student satisfaction. It has climbed to 87 %, a one percent increase from last year’s 86%. U.S. News defines regional universities as those providing a full range of undergraduate majors and master's programs and a few doctoral programs. Regional universities are in four categories—North, South, Midwest, and West—because they generally attract students from the surrounding states. The U.S. News ranking system rests on two pillars. The formula uses exclusively statistical quantitative and qualitative measures that education experts have proposed as reliable indicators of academic quality, and it is based on U.S. News' researched view of what matters in education. To calculate the rankings, U.S. News gathers data from each college on up to 15 indicators of academic excellence.